Astrophotographer Babak Tafreshi caught this Geminid meteor in 2009. If you were disappointed with the meager showing put on by this year's Leonid Meteor Shower, don't fret. What potentially will be the best meteor display of the year is just around the corner, scheduled to reach its peak on Thursday night, Dec. 13: the Geminid Meteors. The Geminids get their name from the constellation of Gemini, the Twins. On the night of this shower's maximum the meteors will appear to emanate from a spot in the sky near the bright star Castor in Gemini. The Geminid Meteors are usually the most satisfying of all the annual showers, even surpassing the famous Perseids of August. Studies of past displays show that this shower has a reputation for being rich both in slow, bright, graceful meteors and fireballs as well as faint meteors, with relatively fewer objects of medium brightness. Geminids typically encounter Earth at 22 miles per second (35 kilometers per second), roughly half the speed of a Leonid meteor. Many appear yellowish in hue. Some even appear to travel jagged or divided paths. Astrophotographer Dennis Mammana caught a Geminid fireball streaking near the stars of Orion. 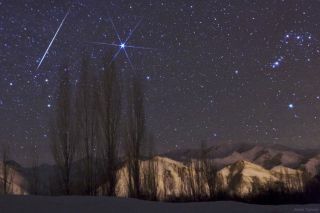 The Geminids perform excellently in any year, but without a doubt 2012 will be a superb year. Last year's display was seriously compromised by bright moonlight when a glowing gibbous moon came up over the horizon during the late evening hours and washed-out many of the fainter Geminid streaks with its bright light. But this year, the moon will be at new phase on Dec.13, meaning no moon will be visible. This means that the sky will be dark and moonless all through the Geminid's peak night, making for perfect viewing conditions for the shower. According to Margaret Campbell-Brown and Peter Brown in the Observer's Handbook of the Royal Astronomical Society of Canada, the Geminids are predicted to reach peak activity at 8 p.m. EST Dec. 13 (00:00 UT on Dec. 14). That means those in Europe and North Africa east to central Russia and China are in the best position to catch the very crest of the shower, when the rates conceivably could exceed 120 meteors per hour! However, maximum rates persist at only marginally reduced levels for some 6 to 10 hours around the biggest ones, so other locations (such as North America) should enjoy some very fine Geminid activity as well. Indeed, under normal conditions on the night of maximum activity, with ideal dark-sky conditions, at least 60 to 120 Geminid meteors can be expected to burst across the sky every hour on average (light pollution greatly cuts the numbers of visible meteors down significantly). Generally speaking, depending on your location, the constellation Gemini begins to come up above the east-northeast horizon right around the time evening twilight is coming to an end. So you might catch sight of a few early Geminids as soon as the sky gets dark. There is a fair chance of perhaps catching sight of some "Earth-grazing" meteors. Earthgrazers are long, bright shooting stars that streak overhead from a point near to even just below the horizon. Such meteors are distinctive because they follow long paths nearly parallel to our atmosphere. The Geminids will begin to appear noticeably more numerous in the hours after 10 p.m. local time, because the shower's radiant is already fairly high in the eastern sky by then. The best views, however, come around 2 a.m., when their radiant point will be passing very nearly overhead. The higher a shower's radiant, the more meteors it produces all over the sky. But keep this in mind: at this time of year, meteor watching can be a long, cold business. You wait and you wait for meteors to appear. When they don't appear right away, and if you're cold and uncomfortable, you're not going to be looking for meteors for very long! The late Henry Neely, who for many years served as a lecturer at New York's Hayden Planetarium, once had this to say about watching for the Geminids: "Take the advice of a man whose teeth have chattered on many a winter's night — wrap up much more warmly than you think is necessary." Hot cocoa or coffee can take the edge off the chill, as well as provide a slight stimulus. It's even better if you can observe with friends. That way, you can keep each other awake, as well as cover more sky. Give your eyes time to dark-adapt before starting. Geminids stand apart from the other meteor showers in that they seem to have been spawned not by a comet, but by 3200 Phaethon, an Earth-crossing asteroid. Then again, the Geminids may be comet debris after all, for some astronomers consider Phaeton to really be the dead nucleus of a burned-out comet that somehow got trapped into an unusually tight orbit. Joe Rao serves as an instructor and guest lecturer at New York's Hayden Planetarium. He writes about astronomy for The New York Times and other publications, and he is also an on-camera meteorologist for News 12 Westchester, New York. Follow SPACE.com on Twitter @Spacedotcom. We're also on Facebook & Google+.